Crate training is a popular way of house training puppies and of keeping them safe when unsupervised. 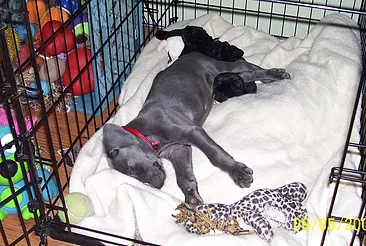 Used correctly, a crate becomes a favourite place for sleeping and quiet time but keeping a puppy or a dog in a crate for too long can also inadvertently encourage them to toilet where they sleep and increase the potential for anxiety problems to develop. However, If you teach your puppy to love his crate it can become a place they love even as an adult dog, as well as being a highly effective toilet training tool. Here are a few hints and tips to make your puppy’s crate a place he loves. The crate needs to be large enough for your dog to stand and turn around. An ideal location for the crate is in part of room that is quiet (i.e. not a corridor) but is a room that the family frequents such as the kitchen. For the crate to remain a positive retreat, it must never be used as a punishment. Some puppies love their crates while others need time to acclimate. Introduce your puppy to his crate by leaving the door open so he can investigate. Make the crate comfortable with bedding and safe toys. Encourage him to go into the crate by throwing a favourite treat or chew inside. If your puppy decides to settle, allow him to do so without closing the door so he can make his own decision about whether to stay or leave. A pheromone such as Adaptil may also help your puppy relax in his crate. Once he is comfortable going into the crate, begin closing the door for a few seconds at a time, gradually building up the duration as long he is relaxed. At this stage you can give your puppy a durable rubber chew toy with some food in it so that he has the pleasure of chewing and eating while he is in the crate. Start putting space between you and the crate, gradually increasing the distance while puppy is settled. This process can take anywhere from a few hours to a few days, but it’s important not to rush. If your puppy begins to whine, make sure you only let him out when he is quiet. Wait for five seconds of quiet before you open the crate door. Each time your puppy goes into his crate, pair his decision with cue words such as ‘go to bed.’ This builds up an association between the cue and the action of walking into his crate. Building up a positive association with puppy’s crate also means you can travel more successfully with him in the future. Never force your puppy inside the crate. Never use the crate as a punishment when he misbehaves. Do not rush the crate-training process or you will end up with a puppy that is fearful or wary of the crate. Do not leave your puppy in the crate for longer than he can hold himself. Doing so will force him to have accidents and make the house training process a lot harder.